The Endo Blog: Root Canal Retreatment or Implant? 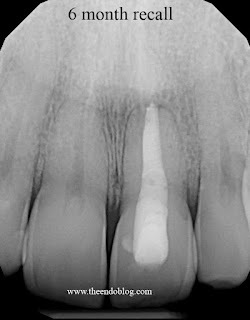 Stan, a recent reader of the blog, commented, "I'm 66 and have an abscessed pre-molar that had rct and a cap 25 years ago. Went to my dentist (who does implants) and was told rct retreatment had a 50% failure rate and the implant-cap was my best option. I had agreed and he injected anesthetic. 15 minutes later, prior to the extraction I commented on the amount of $$ that had already gone into the tooth. Shortly thereafter, after giving me Amoxicillin he said he'd do the extraction in a week. Then on my way out I learned the implant-cap would be a $2700 cost out of my pocket! I'm guessing even he felt that $4K for one tooth is a little much." 3 weeks ago, the following patient presented to our office at Superstition Springs Endodontics. This 41 year old male patient came to our office for a second opinion regarding an implant. In 5th grade he had trauma to his front tooth #9. He had root canal treatment at that time and has never had a problem until 3 months ago. The discoloration of #9 is very obvious, however, it has never really bothered the patient. Not a surprising root canal on a 5th grader. The apex is open, root is short, and the clincian probably did the best he could to obturate this tooth on such a young patient. Please note the normal bone and gingival tissues around the tooth. So this root canal has survived 30 years without symptoms and preserved the periodontium. The patient was concerned about the cost and loss of a tooth which had given him so little problem for so many years. He sought out another general dentist for a second opinion. The next dentist sent him to our office for consultation. Our diagnosis was: Prior RCT w/ Asymptomatic Apical Periodontitis. The tooth was currently symptom free, but had slight mobility and an obvious apical lucency. 2. Extract & Implant - This is an option, but you may want to consider the short term and long term esthetic issues associated with this implant. Short-term esthetic issues would be making a single implant match the adjacent natural teeth. Long term esthetic issue would be loss of crestal bone over time. We recommended saving the tooth. Retreatment elected. The old, poorly condensed gutta percha was removed. Because of the open apex, MTA was selected as the obturation material. Coronal barrier placed to allow for internal bleaching. After course of antibiotics and bleaching treatment, the tooth is asymptomatic, less mobile and fully functional again. I can't imagine anyone arguing that an extraction an implant is a better approach for this patient, but unfortunately there are some with that opinion. I think this may be partly due to a misinformed view of endodontic retreatment. In this particular case, you can see that the original RCT, which lasted only 30 years, without any crestal bone loss was a porous obturation. With normal probing depths and no signs of fracture, retreatment is obviously the best choice. If there are any of you with differing opinions, please share them with us. UPDATE: 6 month recall of this tooth shows complete periapical healing. Patient reports no symptoms and full function. In an effort to help all of us understand the treatment outcomes associated with endodontic retreatment and to properly inform our patients regarding endodontic retreatment, I hope you find this information useful. Another well-known outcome assessment study is known as the Toronto Study (3). Their evaluation of endodontic retreatment included 523 teeth on 444 patients. Of the 34% of patients who were able to be recalled at 4-6 years, 81% were considered "healed". "Healed" being defined as absence of apical periodontitis, signs or symptoms. This study points out that patients who did not have apical periodontitis PRIOR to retreatment had the highest "healed" rate at 97%, while those with apical periodontitis prior to retreatment had a "healed" rate at 78%. Another predictor found in this study was perforations. Retreatments done without a perforation had a "healed" rate at 89%, while retreatments with a perforation had a "healed" rate at 43%. Another retrospective study looking at the success of endodontic treatment (initial RCT and retreatment) performed by a single endodontist in private practice over a 30 year period had similar results. Imura et. al. selected 2000 teeth from a 30 year career for evaluation of success. (4) The success rate for teeth treated with initial endodontic therapy was 94% and the success rate for teeth treated with endodontic retreatment was 85.9%. These articles are just a start. I will try to add more to this body of evidence. Please feel free to suggest any additional articles that should go along with these. In my opinion, when considering retreatment, consider the quality of the initial treatment. Was it well cleaned and shaped? Are there missed canals? Is the obturation good length? Performed under microscope? Level of expertise of the clinician? If these things can be improved upon with retreatment, then you have a good chance for success with retreatment. I think a fair estimate would be between 80-85% success rate. We owe it to our patients to give them the option of retreatment. It is not fair to assume a tooth has a 50% success rate with retreatment. If you are concerned about the prognosis with endodontic retreatment, consult with an endodontist. Endodontists are specialists in saving teeth. 1. Paik, S, Sechrist, C, Torabinejad, M. "Levels of Evidence for the Outcome of Endodontic Retreatment". 2004, JOE 30:11, 745-750. 2. Torabinejad, M, Corr, R, Handysides, R, Shabahand, S. "Outcomes of Nonsurgical Retreatment and Endodontic Surgery: A Systematic Review". 2008, JOE 35:7, p930-937. 3. Farzaneh, M, Abitbol, S, Friedman, S. "Treatment Outcome in Endodontics: The Toronto Study. Phases I and II: Orthograde Retreatment". 2004, JOE 30:9, p627-633. 4. Imura, N, Pinheiro, E, Gomes, B, Zaia, A, Ferraz, C, Souza-Filho, F. "The Outcome of Endodontic Treatment: A Retrospective Study of 2000 Cases Performed by a Specialist". 2007, JOE 33:11, p1278-1282. 5. Salehrabi, R, Rotstein, I. "Epidemiologic Evaluation of the Outcomes of Orthograde Endodontic Retreatment". 2010, JOE 36:5, p790-792. Many unethical or mediocre dentists that should have gone bankrupt, are still in business thanks to placing many unnecessary implants. Thanks for a great case that highlights this, and the excellent prognosis of these cases treated in competent hands. Excellent Post! Too often I hear detractors of endodontic therapy throw out nonsense percentages. Not all retreatment procedures are created equal. For example, the success rate of retreatment when addressing a missed canal (e.g. MB2 in maxillary molars); Conversely, retreating a case with a post removal, a perforation, and a ledged-curved canal is a far more treacherous task that risks finding or causing fractures or just plain not bypassing the ledge. Unfortunately, as Robert says, too many "super" dentists are making far too much money doing poor root canals, having them fail, and then placing implants in their place. Often times not making a single real diagnosis along the way. I should add, that the case you posted is most likely caused by restorative failure, not endodontic failure. I retreated a friend's tooth which had silver point root canal 50 years ago when the patient had trauma at the age of 10. The case only failed when the composite leaked. A root canal is one of the most common dental procedures performed, well over 14 million every year. This simple treatment can save your natural teeth. This post really helps me a lot. Thanks for helping me too see the situation objective. Great post. Retreatment can be a great opportunity for patients to improve their smile and the health of their mouth. Of course, these retreatments should be done by Endodontists. Super results with an excellent prognosis for the future to boot! The patient has almost flawless symmetrical natural anatomy (plus presumeably good hygiene) going in. This case illustrates the dental version of the bird in the hand theory which goes something like this... The certainty of lasting dazzling gingival architecture (with subtle recontour on 9) plus natural enamel's optical qualities trumps any anterior implant with its inherent shade matching -and- gingival/ridge migration eye catchers! I have been a hygienist for 39 years and have worked for several dentists (even outlived a few!!) Most dentists have been extremely ethical and had their patients' best interest at heart. However, there were some that I felt were more interested in stuffing their wallets than looking out for their patients' well being (both dentally and fiscally). The worst ones are the slick, smooth and highly charismatic ones that use their unearned respect and trust from their patients to sell ANY treatment plan. I think this is a gross misuse of their status as doctors. One doctor told a patient in my chair (27 year old female) that she needed #8 and #9 extracted with subsequent implants/crowns. The dentist could be correct but I advised her to seek a second opinion from an endodontist. The endodontist retreated the RC on #8 and did nothing on #9 because of no pathology present. Many years later this woman is asymptomatic with no signs of infection. Thank you for a well researched article that supports the conclusion that root canals can be successfully retreated the majority of the time. If the canal was obturated with MTA which provides a good seal, why is a coronal barrier still necessary to perform the internal bleaching? Is it because you don't want the MTA to be so close to the gingival margin as it discolours the tooth structure and possibly shines through the gingival tissue? Good question. In this particular case, I placed the MTA and did the bleaching at the same time. The MTA was still wet, so I placed a barrier to ensure there would be a seal. Your blog is fabulous.very informative and helpful.Thanks for sharing. Very happy to read thisa informative article. I am faced, right now, with retreatment by a specialist or extraction. I was very worrie that retreatment had a high failure rate, and given that I live in a remote area of Northern Canada, retreatment by a speacialist this time, involve4s not only the procedure, but costly plane flights and hotel stays to 'civilization'; so CAREFUL consideration of my options is imperative. My first RC was done by a regular dentist. After reading this article I feel so much better about this and am booking my flight and appointments now; I can be down south and getting the retreatment in two weeks. Thank you! Really nice Blog and i also heard about Root canal treatment and it is one of the most common treatment these days to save your tooth instead of pulling them out. Thank you for this information. I am currently facing retreatment of a failed root canal 9 years ago. My dentist immediately diagnosed the problem and referred me to an endodontist for consult. As I am a nurse practitioner I was seeking scholarly information (not propaganda or "war stories") to help me understand my alternatives. Your blog has helped me go into that appointment better informed. I also appreciate the skill and integrity of my family dentist. Thanks again! This is certainly among the more fascinating blogs I've seen. It's so easy to tune out, but there is honestly still some excellent things on the net, and I feel your site is honestly one of them! really interesting and informative post.enjoyed reading. Great post! Been reading a lot about getting a root canal. Thanks for the info here!